1.08.05 -- A powerful software tool for identifying the genetic basis for human disease that is hosted by Calit² -- and freely available to researchers -- has been awarded funding to develop possible commercial applications for the drug and biotech industries. It's one of eight new projects funded by the UCSD Jacobs School of Engineering's William J. von Liebig Center for Entrepreneurism and Technology Advancement. The von Liebig Center awarded more than $300,000 to the eight projects that span all five of UCSD's engineering departments as well as its School of Medicine. This is the sixth round of funding since the Center was set up in 2001 to foster entrepreneurism education and to provide funding and advisory services to Jacobs School technology projects that have strong commercial potential. Including this round, the von Liebig Center has awarded a total of nearly $1.8 million to 39 projects led by Jacobs School faculty. The technologies under development range from a non-invasive, handheld device to measure deep-lung gases that could save lives, and photodetectors based on nanowire technology to make better digital cameras, to a new type of 'amorphous steel' that could be used in everything from tennis rackets and armored vehicles to biomedical implants. (For a complete list of the awards, go to http://www.jacobsschool.ucsd.edu/news_events/release.sfe?id=328). 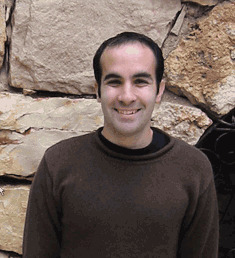 One of the winning projects is led by Eleazar Eskin, an active participant in Calit² and assistant professor in residence in the school's Computer Science and Engineering department. Together with Eran Halperin of UC Berkeley's International Computer Science Institute, Eskin developed a powerful piece of software for performing a unique type of computational genetic analysis: inputting genotypes and outputting haplotypes. Calit² is now hosting the two-year-old HAP Webserver, which has processed over 4,000 datasets from researchers around the world. HAP stands for "haplotype resolution using imperfect phylogeny." A haplotype is a set of closely linked genetic markers present on one chromosome which tend to be inherited together and are not easily separable by recombination. The technique recovers haplotypes from genotype data, and researchers resolve genotypes using the webserver. The HAP Webserver takes as input genotypes and outputs haplotypes for each individual, a block partition, and various information for each block. With the explosion of genomic sequence data and the completion of the human genome project, much of the progress in understanding the genetic basis of disease relies on computational analysis of the genomic data, including data on the variation in genes associated with a disease for a population of individuals. Understanding the genetic basis of disease involves two steps: determining the functional variants in each gene locus that is linked to the disease and the effect of functional variants on the regulation and gene products of the gene; and understanding how these intermediate phenotypes affect disease outcomes. Using this information, researchers can identify subtypes of the disease which are candidates for different drug response. That is the role of the HAP Webserver, which is a lynchpin of Calit²'s Digital Enabled Genomic Medicine layer. In early 2005, a new version of the webserver will be released, and articles in several high-profile publications will highlight the project. While the HAP Webserver itself will remain in the public domain for non-commercial and research purposes, Eskin sees strong commercial potential among pharmaceutical and biotech companies for new tools that tie into the webserver. The von Liebig Center funding will allow the group to work on potential commercial uses of the software. "For the very first time, each one of the five engineering departments of the Jacobs School is represented among the innovative projects selected in a single round of funding," said Steve Halpern, managing director of the von Liebig Center. "All of the projects demonstrated great promise, and while we are only able to make eight cash awards at this time, the Center will continue to work with all of the applicants to develop commercialization strategies for their technologies, and if possible, help them secure other types of funding for their projects." To be eligible for funding from the von Liebig Center, Calit² faculty or researchers must be affiliated with the Jacobs School at UCSD.